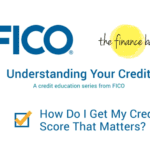 A few weeks back, I had the honor of joining FICO for a stop during their Score a Better Future Roadshow in Atlanta, Georgia. The Score a Better Future Atlanta event was a community education and financial empowerment program presented by FICO in partnership with Operation Hope and the National Consumer League. We sat down with FICO, Operation Hope, and additional key sponsors from the Urban League of Greater Atlanta and Clark Atlanta University to learn more about what they hoped to see attendees take away from the event and how we can continue these conversations so that consumers feel financially empowered throughout the entire year.